Graffiti, Photography, & Writing about Art. I still haven’t solved the problem of how to present graffiti. But I’m trying my hand at the first step: collecting all my data in one place. At the moment, my formal organizational system is in the form of “sets” on Flickr. I made a collection that contains all the sets I’ve made of my ever-expanding collection of photos of graffiti. I still need to get some of the pictures I’ve taken on my phone around both Providence and Amherst/Boston, and marshal them into order. But for now, you have a curated collection of street art from Athens (Summer and Winter of ’09, then Summer ’12 and ’13), London, and a small one from Montreal. But the predominant struggle here is one of How to Write About Art. It’s always nice to have a nice, concise, academic explanation for those impulses that are often so difficult to explain. I am probably never more frustrated than when I’m trying to explain to someone, often my mother or, worse, my grandmother, why I think graffiti is an important area of exploration. 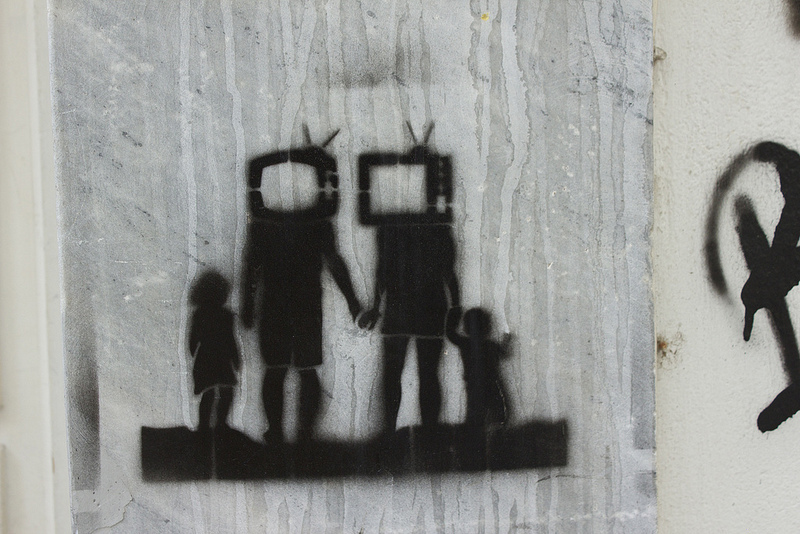 The TV imagery is highly prevalent. Recently this idea that the TV is increasingly responsible for raising children has erupted. Nothing most of us probably didn’t consider covering in the first place. But then you sit down to try and apply these things to in original context. And really, your average college student, when writing about art, is covering old ground. Facing the semi-uncharted waters of graffiti and street art is a little daunting. I am faced with a huge body of work, produced by myriad, unknown artists, who cover a wide range of subjects (and often have philosophies and ideologies that conflict), and are forcibly unified by their form. In this particular case, form necessarily engages with political and social ideas, creating a shared culture, even if the politics or social dialogues within that culture disagree. Graffiti contains an inherent attack on the notion of private property and certain ideas of public space. When you graffiti a building you are rejecting its use by others in social and aesthetic ways. You are co-opting the building and the space around it for yourself, sometimes to build dialogue and sometimes for your own gains. Moving on from form and subject matter, there is the issue of “socio-historical context”. This has its own hurdles. Namely, I am using the messages to attempt to construct an image of the artist. Because I don’t know who made these works, I cannot fully contextualize them politically, socially, or economically. One could be made by a butcher’s son and one could be made by the daughter of a banker, and I would be unable to know for certain. The majority of these individuals are “youth” that is between the ages of about 14 and 25. Their politics usually fall toward one end of the spectrum or the other (let’s call them Fascists and Anarchists), with a greater tendency towards the latter group, for reasons relating to ideas of personal property, public space, and propriety. understanding the work in question as a whole. questions, such as difficulties facing female artists, artists of color, etc. these figures might more accurately be identified as saints. 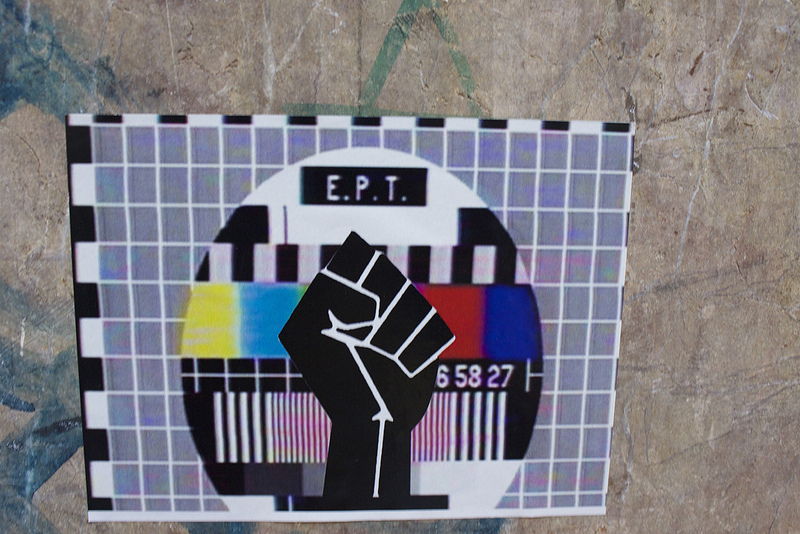 Nearly two weeks after Samaras shut down ERT, I saw this sticker. I feel that the work I’m doing falls somewhere between these three options. My only real option when it comes to analyzing this artwork is through formal analysis. But I’m examining it for evidence relating to the sociological situations these people find themselves in. 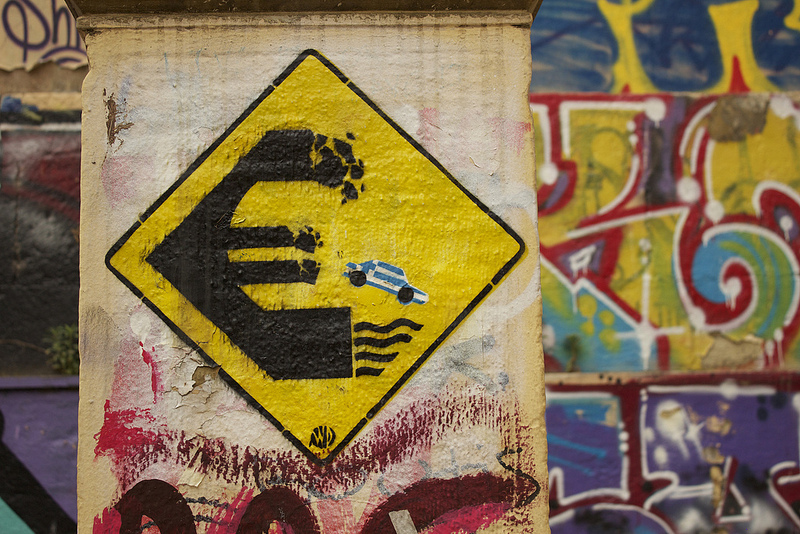 I’m using the imagery and the words in their art work, to try and tease out clues as to where they find themselves, based on what I know about the economic and political situations at work in Greece, and particularly in Athens. This project is huge. And I’m worried that the whole thing will be for naught since the only perspective I have access to is my own. My next step is to find some kind of professional, some kind of expert, (preferably more than one) to better contextualize what I have found. Other people will do this better. And really, already have. But I want to help whomsoever comes across the pictures I have taken, to contextualize these works and help them better understand the realities inspiring them.